20th Century Fox Home Entertainment is celebrating the Wolverine’s upcoming Digital HD released with The Wolverine: Unleashed Experience, an immersive, interactive website optimised for tablet devices. 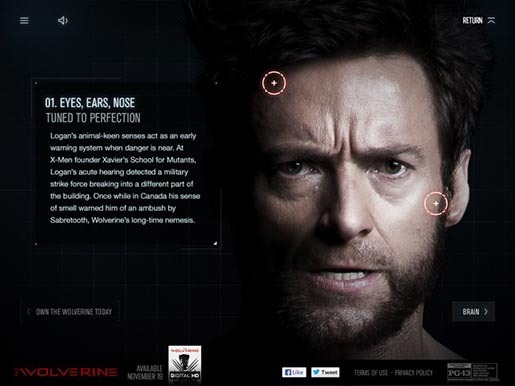 Online at wolverineunleashed.com, the immersive digital experience takes fans deep inside actor Hugh Jackman’s portrayal of the superhero mutant Wolverine. This summer’s The Wolverine marked the sixth film in which Jackman has played the haunted character, and this tablet-based experience is timed to coincide with the film’s Digital HD release on November 19. 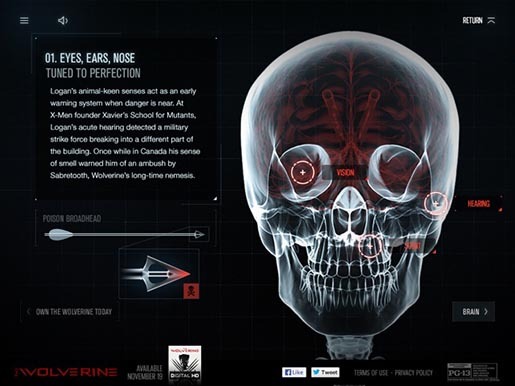 The character-driven immersive experience gives fans and visitors the ability to navigate a full-scale digital version of the Wolverine’s body, allowing them to explore his mutant powers and psyche. Close attention is paid to Jackman’s interpretation and incarnation of Wolverine. 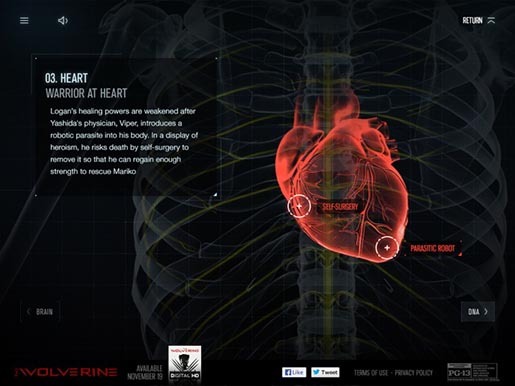 Users can unlock new content, including special feature sneak peeks and bridges to past films. The Wolverine Unleashed project was developed at Soap Creative.